A "single-player digital board game of mystery, experimentation and self-destruction". Hey you, have a read of Joe's interview with Failbetter co-founder and writer Alexis Kennedy, who you'll surely know from Fallen London, Sunless Sea, and from the recent news that he'll be BioWare's first guest writer, scribing probably for something that rhymes with 'Bragon Rage'. 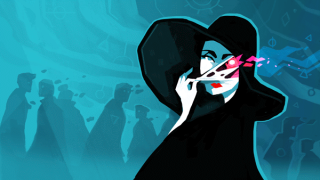 Now you're suitably excited for Kennedy's Cultist Simulator, a "single-player digital board game of mystery, experimentation and self-destruction". Writing on his website, Kennedy says that Cultist Simulator "combines my usual pungent prose with crunchy crafting mechanics, and with parallel victory conditions. It’s possible, though very difficult, to find success in career or romance. You can always turn back from the brink and try to make a life. But why would you do that?" Especially when you can "find abominable rites in dreams. Craft tools and summon spirits. Indoctrinate innocents. Choose between sane and insane victory conditions. Become the herald of a new age". Cultist Simulator will be out sometime around Halloween next year. Probably.